Mercure Roma West is a hotel with a conference centre attached to it. The Cruise Job Fair will be held in the Romolo e Remo meeting room at the conference centre. Enter the hotel through the main entrance and turn right. Go downstairs to the conference centre, the entrance to the event hall is down the corridor on the right. 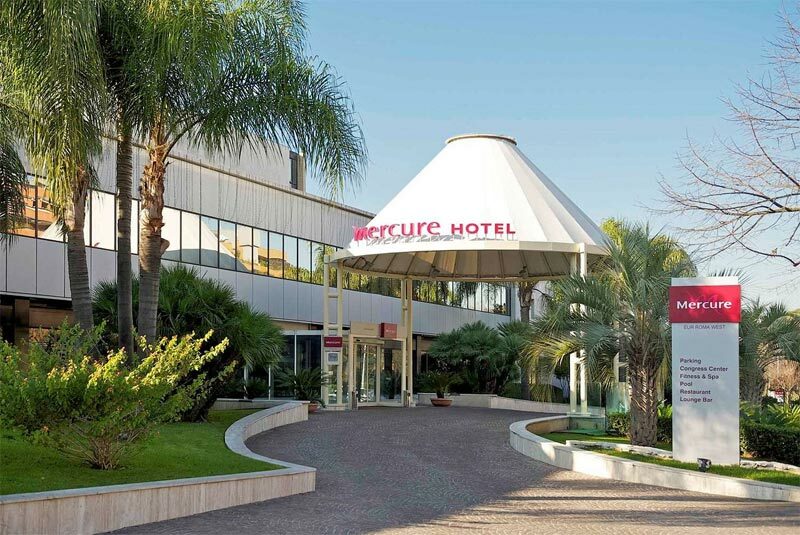 Mercure Roma West is located just outside the Grande Raccordo Anulare (GRA), the motorway ring road around Rome, near exits 26 and 27. The hotel has a free car park available to the visitors. Reach the metro station EUR Fermi and then catch the public bus no. 705. Get off at a bus stop situated close to hotel's main entrance. The journey takes approx. 21 minutes. View more details here. Take the Leonardo Express train from the airport to Roma Ostiense station. Use the Metro from Roma Ostiense to EUR Fermi (6 stops). Then catch bus 705 to the hotel (see above). Guests with accommodation at the hotel may use free shuttle bus from the airport. Please contact the hotel for more information. Take the regional train from the airport to Roma Termini. Change for MEB or MEB1 train to EUR Fermi. Then catch bus 705 to the hotel (see above).